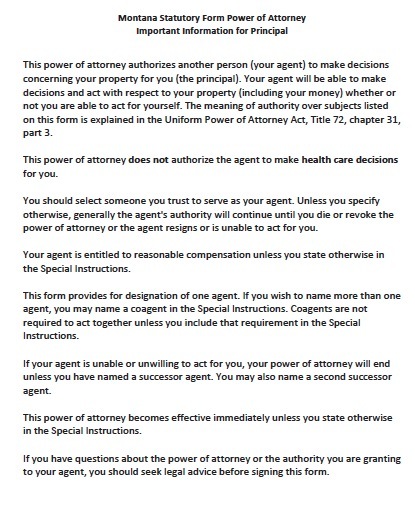 The standard power of attorney form in Montana allows a principal to choose many different financial matters to give his agent authority over. The principal can grant them all, or grant only one or a limited number. This can be convenient, for example, if you only need someone to write checks from your account to pay for routine matters like bills and groceries. Because of the sweeping power you can grant to an agent, it is very important to choose only someone you have great trust in, who will be willing to make financial decisions, and can manage money effectively. There are a number of duties the agent must fulfill: The agent must act in your best interests, honestly, and without benefitting him or herself. In Montana, no witnesses have to sign a financial power of attorney, but having it notarized is recommended.